Transforming Lives. Inventing the Future. Illinois Institute of Technology (Illinois Tech or IIT) is a private research university in Chicago, Illinois. It was established from the merger in 1940 of Armour Institute and Lewis Institute. The university has programs in engineering, science, psychology, architecture, business, communications, industrial technology, information technology, design and law. It traces its history to several 19th-century engineering and professional education institutions in the United States. The Institute of Design, Chicago-Kent College of Law, and Midwest College of Engineering were also merged into it. In 1890, when advanced education was often reserved for society's elite, Chicago minister Frank Wakely Gunsaulus delivered what came to be known as the "Million Dollar Sermon." From the pulpit of his South Side church, near the site Illinois Institute of Technology now occupies, Gunsaulus said that with a million dollars he could build a school where students can learn to think in practical not theoretical terms; where they could be taught to "learn by doing". Inspired by Gunsaulus' vision, Philip Danforth Armour, Sr. (1832–1901) gave $1 million to found the Armour Institute—and Armour, his wife, Malvina Belle Ogden Armour (1842–1927) and their son J. (Jonathan) Ogden Armour (1863–1927) continued to support the university in its early years. When Armour Institute opened in 1893, it offered professional courses in engineering, chemistry, architecture and library science. Illinois Tech was created in 1940 by the merger of Armour Institute and Lewis Institute. Located on the west side of Chicago, Lewis Institute, established in 1895 by the estate of hardware merchant and investor Allen C. Lewis, offered liberal arts as well as science and engineering courses for both men and women. At separate meetings held by their respective boards on October 26, 1939, the trustees of Armour and Lewis voted to merge the two colleges. A Cook County circuit court decision on April 23, 1940 solidified the merger. The Institute of Design (ID), founded in Chicago by László Moholy-Nagy in 1937, merged with Illinois Tech in 1949. Chicago-Kent College of Law, founded in 1887, became part of the university in 1969, making Illinois Institute of Technology one of the few technology-based universities with a law school. Also in 1969, the Stuart School of Management and Finance—now known as the Stuart School of Business – was established thanks to a gift from the estate of Lewis Institute alumnus and Chicago financier Harold Leonard Stuart. The program became the Stuart School of Business in 1999. The Midwest College of Engineering, founded in 1967, joined the university in 1986, giving Illinois Tech a presence in west suburban Wheaton with what is today known as the Rice Campus—home to Illinois Tech's School of Applied Technology. In December 2006, the University Technology Park at Illinois Institute of Technology, an incubator and life sciences/tech start-up facility, was started in existing research buildings located on the south end of Main Campus. As of April 2014[update], the University Tech Park at Illinois Institute of Technology is home to many companies. Today, IIT is a private, Ph.D.-granting university with programs in engineering, science, human sciences, applied technology, architecture, business, design and law. It is one of 16 institutions that comprise the Association of Independent Technological Universities (AITU). S. R. Crown Hall, home of IIT College of Architecture, was named a National Historic Landmark in 2001, and part of the IIT Main Campus was entered into the National Register of Historic Places in 2005. The state-of-the-art, 10-story Downtown Campus at 565 W. Adams Street houses Chicago-Kent College of Law, the Center for Financial Markets, the Master of Public Administration Program, and Stuart School of Business. Institute of Design, an international leader in teaching systemic, human-centered design, is located at 350 N. LaSalle Street in Chicago's River North neighborhood. The 19-acre Daniel F. and Ada L. Rice Campus in west suburban Wheaton complements area community colleges, serving west suburban residents and employees in Illinois' high-tech corridor by offering graduate programs, upper-level undergraduate courses, and continuing professional education. The five-acre Moffett Campus in southwest suburban Bedford Park houses the Institute for Food Safety and Health, including its National Center for Food Safety and Technology, a consortium of government, industry and academia that seeks to improve the quality and safety of the nation's food supply. S. R. Crown Hall on the Illinois Institute of Technology campus. Designed by Ludwig Mies van der Rohe in 1956, it was designated a National Historic Landmark in 2001. IIT continued to expand after the merger. As one of the first American universities to host a Navy V-12 program during World War II the school saw a large increase in students and expanded the Armour campus beyond its original 7 acres (2.83 ha). Two years before the merger, German architect Ludwig Mies van der Rohe joined the then Armour Institute of Technology to head both Armour's and the Art Institute of Chicago's architecture program. The Art Institute would later separate and form its own program. Mies was given the task of designing a completely new campus, and the result was a spacious, open, 120-acre (48.6 ha) campus set in contrast to the busy, crowded urban neighborhood around it. The first Mies-designed buildings were completed in the mid-1940s, and construction on what is considered the "Mies Campus" continued until the early 1970s. Engineering and research also saw great growth and expansion from the post-war period until the early 1970s. IIT experienced its greatest period of growth from 1952 to 1973 under President John T. Rettaliata, a fluid dynamicist whose research accomplishments included work on early development of the jet engine and a seat on the National Aeronautics and Space Council. This period saw IIT as the largest engineering school in the United States, as stated in a feature in the September 1953 issue of Popular Science magazine. IIT housed many research organizations: IIT Research Institute (formerly Armour Research Foundation and birthplace of magnetic recording wire and tape as well as audio and video cassettes), the Institute of Gas Technology, and the American Association of Railroads, among others. Three colleges merged with IIT after the 1940 Armor/Lewis merger: Institute of Design in 1949, Chicago-Kent College of Law in 1969, and Midwest College of Engineering in 1986. IIT's Stuart School of Business was founded by a gift from Lewis Institute alumnus Harold Leonard Stuart in 1969, and joined Chicago-Kent at IIT's Downtown Campus in 1992; it phased out its undergraduate program (becoming graduate-only) after spring 1995. (An undergraduate business program focusing on technology and entrepreneurship was launched in fall 2004 and was for a while administratively separate from the Stuart School. It is now part of the school, but remains on Main Campus.) The Institute of Design, once housed on the Main Campus in S.R. Crown Hall, also phased out its undergraduate programs and moved downtown in the early 1990s. Although not used in official communication, the nickname "Illinois Tech" has long been a favorite of students, inspiring the name of the student newspaper; (renamed in 1928 from Armour Tech News to TechNews), and the former mascot of the university's collegiate sports teams, the Techawks. During the 1950s and 1960s, the nickname was actually more prevalent than "IIT." This was reflected by the Chicago Transit Authority's Green Line rapid transit station at 35th and State being named "Tech-35th", but has since been changed to "35th-Bronzeville-IIT." In the 2010s, school administrators began a move to reintroduce the "Illinois Tech" nickname, to decrease confusion with the Indian Institutes of Technology that share the IIT abbreviation and with ITT Technical Institute whose abbreviation is similar. In 1994, the National Commission on IIT considered leaving the Mies Main Campus and moving to the Chicago suburbs. Construction of a veritable wall of Chicago Housing Authority high-rises replaced virtually all of IIT's neighbors in the 1950s and 1960s, a well-meaning but flawed attempt to improve conditions in an economically declining portion of the city. The closest high-rise, Stateway Gardens, was located just south of the IIT campus boundary, the last building of which was demolished in 2006. But the Dearborn Homes to the immediate north of campus still remain. The past decade has seen a redevelopment of Stateway Gardens into a new, mixed-income neighborhood dubbed Park Boulevard; the completion of the new central station of the Chicago Police Department a block east of the campus; and major commercial development at Roosevelt Road, just north of the campus, and residential development as close as Michigan Avenue on the east boundary of the school. Bolstered by a $120 million gift in the mid-1990s from IIT alumnus Robert Pritzker, former chairman of IIT's board of trustees, and Robert Galvin, former chairman of the board and former Motorola executive, the university has benefited from a revitalization. The first new buildings on Main Campus since the "completion" of the Mies Campus in the early 1970s were finished in 2003—Rem Koolhaas's McCormick Tribune Campus Center and Helmut Jahn's State Street Village. S. R. Crown Hall, a National Historic Landmark, saw renovation in 2005 and the renovation of Wishnick Hall was completed in 2007. Undergraduate enrollment has breached 2,500. To further boost their focus on biotechnology and the melding of business and technology, University Technology Park At IIT, an expansive research park, has been developed by remodeling former Institute of Gas Technology and research buildings on the south end of Main Campus. IIT is divided into five colleges (Armour College of Engineering, College of Science, Lewis College of Human Sciences, College of Architecture, Chicago-Kent College of Law), an institute (Institute of Design), two schools (School of Applied Technology, Stuart School of Business), and a number of research centers, some of which provide academic programs independent of the other academic units. While many maintain undergraduate programs, some only offer graduate or certificate programs. In 2003, IIT administrators split the former Armour College of Engineering and Science into two colleges known as the Armour College of Engineering and the College of Science and Letters. The Armour College of Engineering is composed of five departments: the Department of Biomedical Engineering, the Department of Biological and Chemical Engineering, the Department of Civil, Architectural and Environmental Engineering, the Department of Mechanical, Materials and Aerospace Engineering, and the Department of Computer and Electrical Engineering. In 2013, IIT administrators reorganized the College of Science and Letters and Institute of Psychology, forming the College of Science (Department of Applied Mathematics, the Department of Biology, the Department of Chemistry, the Department of Physics, the Department of Computer Science, and the Department of Mathematics and Science Education), and the Lewis College of Human Sciences (the Department of Humanities, the Department of Psychology, and the Department of Social Sciences). The School of Applied Technology was founded as the Center for Professional Development in 2001 in order to provide technology oriented education for working professionals. In December 2009, IIT announced the formation of the School of Applied Technology, composed of undergraduate and graduate degree programs in Industrial Technology and Management (INTM) and Information Technology and Management (ITM), as well as non-credit Professional Learning Programs (PLP). These programs were all formerly part of the Center for Professional Development. Professional Learning Programs offers non-credit continuing education courses and certificates, corporate training, a Professional Engineering Exam Review program, international programs including English as a Second Language instruction, short courses and seminars ranging from a few hours to several days in length. In 2014 the Department of Food Science and Nutrition was formally launched within the School of Applied Technology, formed from degree programs originating within IIT's Institute for Food Safety and Health (IFSH). Chicago-Kent College of Law began in 1886 with law clerks receiving tutorials from Appellate Judge Joseph M. Bailey in order to prepare for the newly instated Illinois Bar Examination. By 1888 these evening sessions developed into formal classes and the Chicago College of Law was established. It was not until 1969 that the school was incorporated into Illinois Institute of Technology. IIT also offers many dual admission programs including programs in medicine, optometry, pharmacy, law, and business. The programs in medicine are particularly competitive and include an 8-year program with Midwestern University leading to a D.O. degree and a 6-year program with Rush University leading to a M.D. degree, both of which are earned after satisfactory completion of a bachelor's degree from IIT. The IIT/Midwestern program accepts anywhere from 5 to 10 students each year, and the IIT/Rush program accepts anywhere from 0 to 4 students each year. IIT was ranked as a tier 1 university being the 96th best university nationally (climbing seven places up from the previous year), and the fourth best university in the Chicago metropolitan area (after the University of Chicago, Northwestern University, and Loyola University Chicago), based on U.S. News & World Report's "Best Colleges 2019." IIT-Kent was ranked as a tier 2 law school being the 68th best law school nationally (5th in Trial Advocacy, 11th in Intellectual Property Law, and 21st in Part-time Law) based on U.S. News & World Report." Several buildings on the Illinois Institute of Technology main campus, such as Machinery Hall pictured here, have been designated as Chicago Landmarks and National Register of Historic Places. The main campus is located at 10 West 35th Street in Chicago's Bronzeville neighborhood and houses all undergraduate programs and graduate programs in engineering, sciences, architecture, communications, and psychology. The downtown campus at 565 West Adams Street in Chicago houses Chicago-Kent College of Law, Stuart School of Business, and the graduate programs in Public Administration. Institute of Design is located at 350 North LaSalle Street in Chicago. Daniel F. and Ada L. Rice Campus in Wheaton, Illinois houses the School of Applied Technology and degree programs in Information Technology and Management. This 19-acre (7.69 ha) campus opened its doors in January 1991. Moffett Campus in Bedford Park, Illinois, is home to the Institute for Food Safety and Health. Moffett Campus was donated to IIT by CPC International Inc. in 1988. VanderCook College of Music shares IIT's Main Campus: VanderCook College of Music and offers cross-registration for IIT students. The Paul V. Galvin Library, designed by architect Walter Netsch in 1962. It is named for the founder of Motorola. The 120-acre (48.6 ha) IIT main campus is centered around 33rd and State Streets, approximately 3 miles (4.8 km) south of the Chicago Loop in the historic Bronzeville neighborhood on the South Side of Chicago, part of the Douglas community area. Also known as the Black Metropolis District, the area is a landmark in African-American history. Following rapid growth during the Great Migration of African-Americans from the south between 1910 and 1920, it became home to numerous African-American owned businesses and cultural institutions and offered an alternative to the race restrictions that were prevalent in the rest of the city. The area was home to author Gwendolyn Brooks, civil rights activist Ida B. Wells, bandleader Louis Armstrong, pilot Bessie Coleman and many other famous African-Americans during the mid-20th century. The nine extant structures from that period were added jointly to the National Register of Historic Places in 1986 and designated a Chicago Landmark in 1998. In 1941, the Chicago Housing Authority began erecting massive public housing developments in the area. By 1990, the IIT campus was encircled by high-rise housing projects rife with crime. The projects were demolished beginning in 1999, and the area began to revitalize, with major renovations to King Drive and many of the historic structures and an influx of new, upscale, housing developments. Neighborhood features include U.S. Cellular Field, home of the Chicago White Sox, Burnham Park and 31st Street Beach on the Lake Michigan waterfront, and historical buildings from the heyday of the Black Metropolis era, including the Chicago Bee Building, the Eighth Regiment Armory, and the Overton Hygienic Building. The campus is bordered on the west by the Chicago 'L' Red Line, which runs parallel to Lake Michigan north to Rogers Park and south to 95th street. 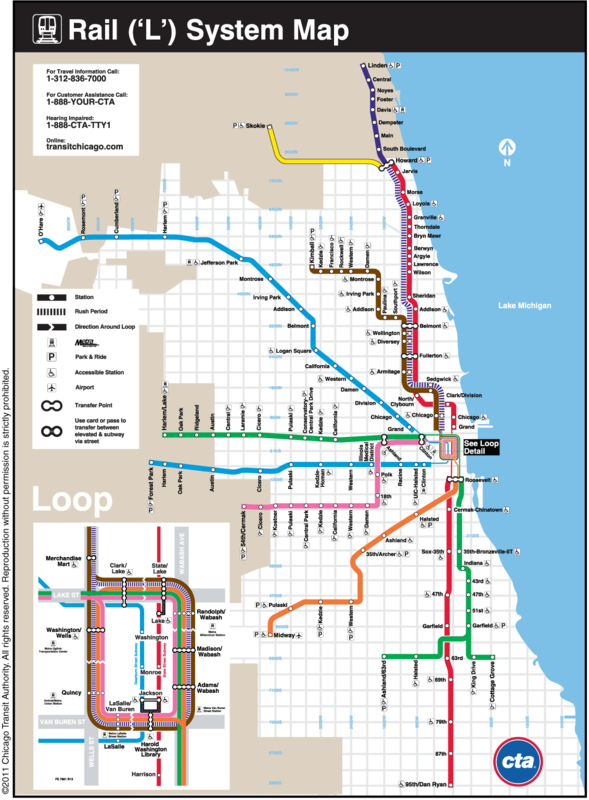 The Green Line bisects the campus and runs north to the Loop and then west to the near west suburbs and south to the Museum Campus and the University of Chicago. Today IIT continues to support the Historic Bronzeville area by sponsoring non-for-profits such as The Renaissance Collaborative. The McCormick Tribune Campus Center. Icons of male figures in action are placed throughout the building; several are visible at the lower left. The campus, roughly bounded between 31st and 35th streets, Michigan Avenue and the Dan Ryan Expressway, was designed by modernist architect Ludwig Mies van der Rohe, "one of the great figures of 20th-century architecture", who chaired the IIT School of Architecture from 1938 to 1958. Van der Rohe's master plan for the IIT campus was one of the most ambitious projects he ever conceived and the campus, with twenty of his works, is the greatest concentration of his buildings in the world. The layout of the campus departs radically from "traditional college quadrangles and limestone buildings". The materials are inspired by the factories and warehouses of Chicago's South Side and "embod[y] 20th century methods and materials: steel and concrete frames with curtain walls of brick and glass." The campus was landscaped by van der Rohe's close colleague at IIT, Alfred Caldwell, "the last representative of the Prairie School of landscape architects." Known as "the nature poet", Caldwell's plan reinforced van der Rohe's design with "landscaping planted in a free-flowing manner, which in its interaction with the pristine qualities of the architecture, introduce[d] a poetic aspect." On the west side of Main Campus are three red brick buildings that were original to Armour Institute, built between 1891 and 1901. In 1938, Ludwig Mies van der Rohe began his 20-year tenure as director of IIT's School of Architecture (1938–1959). The university was on the verge of building a brand new campus, to be one of the nation's first federally funded urban renewal projects. Mies was given carte blanche in the large commission, and the university grew fast enough during and after World War II to allow much of the new plan to be realized. From 1943 to 1957, several new Mies buildings rose across campus, including the S.R. Crown Hall, which houses the architecture school, and was designated a National Historic Landmark in 2001. Although Mies had emphasized his wish to complete the campus he had begun, commissions from the late 50s onward were given to Skidmore, Owings & Merrill (SOM), prompting Mies to never return to the campus that had changed architecture the world over. SOM architect Walter Netsch designed a few buildings, including the new library that Mies had wished to create, all of them similar to Mies's style. By the late 1960s, campus addition projects were given to SOM's Myron Goldsmith, who had worked with Mies during his education at IIT and thus was able to design several new buildings to harmonize well with the original campus. In 1976, the American Institute of Architects recognized the campus as one of the 200 most significant works of architecture in the United States. The new campus center, designed by Rem Koolhaas, and a new state-of-the-art residence hall designed by Helmut Jahn, State Street Village, opened in 2003. These were the first new buildings built on the Main Campus in 32 years. In 1976, American Institute of Architects named the IIT campus one of the 200 most significant works of architecture in the United States. The IIT Main Campus was added to the National Register of Historic Places in 2005. In 2010, IIT received the Princeton Review's highest sustainability rating among universities in Illinois, tied with the University of Illinois at Urbana–Champaign. S. R. Crown Hall, erected in 1955, was considered by Mies to be one of his greatest architectural achievements. To provide for a flexible, columnless interior, he suspended the roof from four steel girders supported by eight external columns spaced 60 feet apart. S. R. Crown Hall, home to Illinois Tech's College of Architecture, has been described as an "immortal contribution to the architecture of Chicago and the world." S. R. Crown Hall was granted National Historic Landmark status in 2001. A $15 million renovation, completed in August 2005, modernized the structure with energy-saving mechanicals and windows, along with needed technology upgrades for computers and the Internet—all while carefully preserving the architectural integrity of the building, inside and out. Additional improvements were completed in 2013. State Street Village (SSV), a student residence hall designed by Murphy/Jahn architects on the southeast corner of 33rd and State Streets just south of the campus center, was completed in August 2003. Helmut Jahn, who studied architecture at IIT under Mies van der Rohe in the late 1960s, is responsible for the innovative design of the residence hall. The structure is composed of three separate five-story buildings, joined by exterior glass walls that muffle noise from passing trains on the adjacent "L" tracks. SSV houses 367 students in apartment-style and suite-style units. The McCormick Tribune Campus Center (MTCC) at 33rd and State Streets opened in September 2003. Designed by Dutch architect Rem Koolhaas, considered one of the "10 most influential living architects by the American Institute of Architects," the campus center arranges various areas around diagonal pathways, resembling interior streets, that are extensions of the paths students use to cross the campus. The design includes a concrete and stainless steel tube that encloses a 530-foot stretch of the Green Line elevated commuter rail ("L") tracks, passing directly over the one-story campus center building. The tube dampens the sound of trains overhead as students enjoy food courts, student organization offices, retail shops, a recreational facility and campus events. The newest addition to the Mies Campus will come from Chicago architect John Ronan who was selected to design the Ed Kaplan Family Institute for Innovation and Tech Entrepreneurship. Ronan's building, the first new academic building in more than forty years, is scheduled for completion in 2018. Illinois Institute of Technology has four campuses in the Chicago area. A portion of the 120-acre Main Campus, identified as the Illinois Institute of Technology Academic Campus, was entered onto the National Register of Historic Places in 2005. The complete 120-acre campus, also known as the Mies Campus, was designed by Ludwig Mies van der Rohe, universally considered one of the 20th century's most influential architects and the director of the architecture program at Illinois Tech from 1938 to 1958. In 1976, the American Institute of Architects recognized the Illinois Tech main campus, centered at 33rd and State Streets in Chicago, as one of the 200 most significant works of architecture in the United States. S. R. Crown Hall, home of Illinois Tech's College of Architecture, was named a National Historic Landmark in 2001. The Illinois Institute of Technology Academic Campus undertook a series of projects with Peter Lindsay Schaudt Landscape Architecture, Inc. (now Hoerr Schaudt) in 2000 to revitalize the historic campus. Keeping in spirit with the original design of landscape architect Alfred Caldwell (1903-1998) who worked closely with van der Rohe, the landscape architects at Peter Lindsay Schaudt played upon his concept of horizontality and favored a native plant palette. The projects created cohesive formal and informal spaces for students and faculty to relax and gather that honor the connection between the original architecture and landscape architecture. The projects included State Street Boulevard, Crown Hall, Federal Street, State Street Village, a planting restoration for Crown Hall, the IITRI Tower Renovation, and the IIT Research Park. Upon their completion in 2005, the firm Peter Lindsay Schaudt submitted the projects as a single entry for the National ASLA design competition, winning the General Design Award of Honor. The ten-story Downtown Campus at 565 West Adams Street, designed by Gerald Horn of Holabird & Root and built by IIT in 1992, is home to Illinois Tech's Chicago-Kent College of Law and Institute of Design (ID), as well as the downtown campus for the Stuart School of Business. ID will re-locate to the Ed Kaplan Family Institute for Innovation and Tech Entrepreneurship on the Mies Campus when the building is completed. The 19-acre Daniel F. and Ada L. Rice Campus in west suburban Wheaton, designed by Solomon Cordwell Buenz & Associates, Inc. for Illinois Tech and dedicated in 1990, offers graduate programs, upper-level undergraduate courses, and continuing professional education. The five-acre Moffett Campus in southwest suburban Bedford Park was designed in 1947 by Schmidt, Garden, and Erickson and was donated to IIT in 1988. It houses the Institute for Food Safety and Health (IFSH), which includes the National Center for Food Safety and Technology, a unique consortium of government, industry, and academic partners. There are numerous student organizations available on campus, including religious groups, academic groups, and student activity groups. Three of Illinois Tech's major student organizations serve the entire student body: the Student Government Association (SGA), the Student Union Board (UB), and TechNews. SGA is the governing student body and acts as a liaison between university administration and the student body, serves as a forum to express student opinion, and provides certain services to student organizations such as official recognition and distribution of funds. Union Board serves as the main event programming group and plans more than 180 on- and off-campus events for students annually. Founded in 1938 UB is responsible for the emergence of the school spirit and booster group Scarlet Fever. TechNews is the campus paper and serves as a news outlet for campus interests and as another outlet for student opinion in both a weekly paper edition and online format; it has existed since at least the 1930s. Illinois Tech hosts a campus radio station, WIIT, with a radio studio in The McCormick Tribune Campus Center. In September 2007 the university opened a nine-hole disc golf course which weaves around the academic buildings on Mies (Main) Campus and is the first disc golf course to appear within the Chicago city limits. In anticipation of the opening of The McCormick Tribune Campus Center, the on-campus pub and bowling alley known as "The Bog" ceased operations in 2003. However, in response to students, faculty, and staff who missed the former campus hangout, The Bog reopened in February 2007 and is now open every Thursday and Friday night offering bowling, billiards, table tennis, and video games. The Bog is also home to the campus bar, which serves beer and wine, and hosts weekly events such as comedians, live bands, or karaoke nights on its stage. In fall 2007, the third generation of a cappella groups was formed, The TechTonics, a coed group of students. Within a year the organization expanded and now includes an all-male group, the Crown Joules, and an all-female group, the X-Chromotones. IIT A Cappella performs a variety of shows on campus as well as off campus and in the midwest. They perform shows at the end of each semester which showcase everything they have learned. Illinois Institute of Technology Mies (Main) Campus has an established Greek System, which consists of six Illinois Tech fraternities (and one VanderCook College of Music fraternity) and three sororities. Fraternities Pi Kappa Phi, Delta Tau Delta, Alpha Sigma Phi, Phi Kappa Sigma, and Triangle fraternity and sororities Kappa Phi Delta, and Alpha Sigma Alpha have chapter houses. The Zeta Pi Omega sorority and Omega Delta fraternity do not. Illinois Tech's athletic teams, known as the Scarlet Hawks, features men's baseball, basketball, cross country, lacrosse, soccer, swimming and diving, tennis, track and field, tennis, and volleyball; women's sports are basketball, cross country, lacrosse, soccer, swimming and diving, tennis, track and field, and volleyball. The Scarlet Hawks athletic program completed the transition to NCAA Division III Athletics in 2018. The university previously competed in the National Association of Intercollegiate Athletics (NAIA) at the NAIA Division I level in the Chicagoland Collegiate Athletic Conference (CCAC) until the 2012–13 season. Illinois Tech discontinued its men's and women's basketball programs after the 2008–09 season, but reinstated them beginning with the 2012–13 season. The men's basketball team played in its first United States Collegiate Athletic Association Division I Championship in March 2017. Although the team lost to Concordia Alabama, the Scarlet Hawks finished the season at 22–6. Illinois Tech also has a cricket team as a part of non-varsity sports level that competes in Division II of the Midwest Cricket Conference. Illinois Tech joined the Northern Athletics Collegiate Conference in 2018, coinciding with the program's acceptance as a full NCAA Division III member. ^ As of June 30, 2014. "U.S. and Canadian Institutions Listed by Fiscal Year 2014 Endowment Market Value and Change in Endowment Market Value from FY 2013 to FY 2014 (Revised February 2015)" (PDF). 2014 NACUBO-Commonfund Study of Endowments. National Association of College and University Business Officers. Archived from the original (PDF) on 2017-02-23. Retrieved 2015-02-15. ^ "Alan W. Cramb, Provost". Iit.edu. Retrieved 3 December 2017. ^ "Office of the Provost - Illinois Institute of Technology". ^ a b "IIT Viewbook" (PDF). 2008. pp. &nbsp, 64. Archived from the original (PDF) on 2008-11-22. Retrieved 2009-03-14. ^ a b c d "Quick Facts for Fall 2017". Illinois Institute of Technology. 2017. Retrieved 1 February 2018. ^ "Graphic Standards Manual" (PDF). Illinois Institute of Technology. Retrieved 12 February 2019. ^ IIT Archives/1998.186/Armour Institute of Technology Records. ^ IIT Archives/1998.001/Lewis Institute Records. ^ IIT Archives/1998.211/Board of Trustee Records/Meeting Minutes; IIT Archives/1998.212/Board of Trustee Records/Executive Committee Records. ^ See photo of this event in IIT Archives/1998.199.002/Unprocessed Photographs (Box A-2)/Folder: Serge Chermayeff: "Serge Chermayeff, Crombie Taylor, H. T. Heald signing Institute of Design merger agreement". ^ IIT Archives/1991.006.19/Deceased Donor Files/Stuart (note that some materials in this collection may be restricted); 1998.033/Biographical Files/Box S/Stuart. ^ IIT Archives/2003.021/Midwest College of Engineering Records. ^ IIT Archives/RG010.03.06/Daniel F and Ada l. Rice Campus; IIT Archives 1993.002/Rice Campus Collection. ^ IIT Archives/2006.012/University Technology Park at IIT Collection. ^ IIT Archives/2001.042/S. R. Crown Hall Collection-National historic Landmark Nomination. ^ a b IIT Archives/2005.018/National Register of Historic Places–IIT Academic Campus Nomination. ^ a b "S.R. Crown Hall". National Historic Landmark summary listing. National Park Service. 2001-08-07. Archived from the original on 2011-06-05. Retrieved 2010-04-22. ^ "About IIT NROTC : History". Chicago, Illinois: Illinois Institute of Technology. 2011. Retrieved September 28, 2011. ^ Zorn, Eric (2015-08-28). "'IIT' on its way out". Chicago Tribune. Retrieved 2015-08-31. ^ a b c "Illinois Institute of Technology – Best Colleges". U.S. News & World Report. Archived from the original on 2018-08-25. Retrieved 2018-09-10. ^ "IIT Science and Letters – Facts about CSL". IIT. Archived from the original on 2010-05-27. Retrieved 2009-08-18. ^ "IIT Armour College of Engineering". IIT. Retrieved 2009-08-18. ^ "IIT College of Science - Illinois Institute of Technology". science.iit.edu. Retrieved 3 December 2017. ^ "Home - IIT Lewis College of Human Sciences - Illinois Institute of Technology". Humansciences.iit.edu. Retrieved 3 December 2017. ^ a b Summerfield, Carol J.; Devine, Mary Elizabeth; Levi, Anthony. "International dictionary of university histories." Taylor & Francis, 1998. page 205. ISBN 1-884964-23-0. ^ "IIT College of Architecture". Iit.edu. Retrieved 3 December 2017. ^ "About - IIT School of Applied Technology". Iit.edu. Archived from the original on 2014-02-13. Retrieved 3 December 2017. ^ "Daily Herald Electronic Archives". The Daily Herald. Retrieved 2009-08-19. ^ "IIT Today, Dec 17, 2009". IIT. Retrieved 2010-02-08. ^ "About the School of Applied Technology at IIT". IIT. Archived from the original on 2012-02-01. Retrieved 2011-12-30. ^ "Professional Learning International Programs". IIT. Archived from the original on 2012-01-02. Retrieved 2011-12-30. ^ "About the Department of Food Science and Nutrition". IIT. Retrieved 2015-07-17. ^ "Chicago-Kent College of Law". IIT. Archived from the original on 2010-05-27. Retrieved 2009-08-19. ^ "IIT Stuart". IIT. Archived from the original on June 4, 2009. Retrieved 2009-08-19. ^ "Illinois Institute of Technology". The Princeton Review. Retrieved 2013-08-05. ^ "Illinois Institute of Technology". U.S. News & World Report. Archived from the original on 2011-03-03. Retrieved 2013-09-10. ^ , Newsweek's Most Rigorous Schools 2012. ^ a b "Best Graduate Schools: Illinois Institute of Technology (Armour)". U.S. News & World Report. Retrieved 2013-03-12. ^ "World's Best Design Schools". Bloomberg Business. Retrieved 2015-10-24. ^ "IIT Named National Center of Academic Excellence in Cyber Defense Education". Illinois Institute of Technology. Retrieved 2015-07-17. ^ "Letter designating Illinois Institute of Technology as a National Center of Academic Excellence in Cyber Defense Education" (PDF). National Security Agency. Retrieved 2015-07-17. ^ Institute for Food Safety and Health. "Commonsense Science. Uncommonly Practised" (PDF). Archived from the original (PDF) on 2013-07-21. Retrieved 21 March 2014. ^ "IIT - Inventing the Future". Illinois Institute of Technology. Retrieved 2010-04-23. ^ "IIT History - Inventing the Future". Illinois Institute of Technology. Retrieved 2010-04-22. ^ "Visitor Information". Illinois Institute of Technology. Archived from the original on 2010-05-08. Retrieved 2010-04-22. ^ a b "Excerpt from the National Register Nomination for Chicago's Black Metropolis". National Park Service. Retrieved 2010-04-22. ^ "Bronzeville History". Bronzeville Cultural Tour. Archived from the original on 2012-07-08. Retrieved 2010-04-22. ^ Hunt, D. Bradford (2009). Blueprint for Disaster: The Unraveling of Chicago Public Housing. Chicago: University of Chicago Press. p. 3. ISBN 0-226-36085-7. ^ a b Hrya, Derek (2008). The new urban renewal: the economic transformation of Harlem and Bronzeville. Chicago: University of Chicago Press. p. 89. ISBN 0-226-36604-9. ^ Severinsen, Kay (1995-05-26). "A Rebirth in Bronzeville; Housing Renovation Boom Sparks Community Spirit". Chicago Sun-Times. Archived from the original (subscription required) on 2012-11-04. Retrieved 2010-04-23. ^ Rail 'L' System Map (Map). Chicago Transit Authority. Archived from the original on 2011-10-25. Retrieved 2010-04-23. ^ "Sponsors". The Renaissance Collaborative. Retrieved 3 December 2017. ^ Reed, Cheryl (2003-10-01). "IIT architect would love encore Designer of student center would like to build high-rise here". Chicago Sun-Times. Archived from the original (subscription required) on 2012-11-04. Retrieved 2010-04-23. ^ "Mies van der Rohe Dies at 83; Leader of Modern Architecture". The New York Times. 1969-08-19. Retrieved 2010-04-22. ^ "Bauhaus Roots at IIT: A Heritage of Innovation and Experimentation". The Mies van der Rohe Society. Retrieved 2010-04-22. ^ a b c "Original Master Plan". The Mies van der Rohe Society. Retrieved 2010-04-22. ^ "Mies: The Man, The Legacy". Mies van der Rhoe Society. Retrieved 2010-04-23. ^ "Alfred Caldwell". Illinois Institute of Technology. Retrieved April 22, 2014. ^ Domer, Dennis. "The Last Master" (PDF). Inland Architect Magazine. p. 69. Retrieved 2010-04-22. ^ Drell, Darienne (1997-09-28). "Rooted in design; Caldwell's Prairie-style landscapes are thriving". Chicago Sun-Times. Archived from the original (subscription required) on 2012-11-04. Retrieved 2010-04-23. ^ Richards, J. M.; Pevsner, Nikolaus; Sharp, Dennis (2000). The Anti-Rationalists and the Rationalists. Oxford: Architectural Place. ISBN 0750648155. ^ Schweiterman, Joseph P; Caspall, Dana M; Heron, Jane (2006). The Politics of Place: A History of Zoning in Chicago. Chicago, IL: Lake Claremont Press. p. 51. ISBN 1-893121-26-7. ^ "The Princeton Review's Guide to 286 Green Colleges" (pdf). The Princeton Review. p. 76. Retrieved 2010-04-22. ^ IIT Archives/2004.051/S. R. Crown Hall Collection-Historic Structure Report; IIT Archives/2012.028.02/Campus Building Blueprints. ^ IIT Archives/RG010.09/Ed Kaplan Family Institute for Innovation and Tech Entrepreneurship. ^ Marotti, Ally. "Illinois Tech delays, downsizes new innovation building". Chicagotribune.com. Retrieved 3 December 2017. ^ IIT Archives/2001.042/S. R. Crown Hall Collection. ^ "Illinois Institute of Technology". Hoerr Schaudt. Retrieved 2018-12-03. ^ "ASLA 2005 Professional Awards". www.asla.org. Retrieved 2018-12-03. ^ "Campus Locations | Illinois Institute of Technology". web.iit.edu. Retrieved 2017-04-02. ^ a b IIT Archives/1999.017/Office of Public Information-Mary Dawson Papers. ^ "IIT Student Government Association (SGA)". Retrieved 2009-07-17. ^ "IIT Student Union Board (UB)". Archived from the original on 2009-09-26. Retrieved 2009-07-17. ^ "IIT TechNews". Retrieved 2009-07-17. ^ Shaughnessy, Ciaran (2008-05-06). "A Cappella Back at IIT". TechNews. Retrieved 2009-03-12. ^ "Illinois Tech to Join NCAA Division III This Fall". ILLINOIS TECH MEDIAROOM. Illinois Institute of Technology. Retrieved 4 October 2018. ^ Olkon, Sara (2009-03-26). "IIT shuts down basketball program". Chicago Breaking News Center. Retrieved 2009-04-13. ^ "Illinois Tech Joins Northern Athletics Collegiate Conference". ILLINOIS TECH ATHLETICS. Illinois Institute of Technology. Retrieved 5 May 2017. ^ Lederman, Leon M. (1988). Frängsmyr, Tore; Ekspång, Gösta (eds.). "The Nobel Prize in Physics 1988: Leon M. Lederman, Melvin Schwartz, Jack Steinberger". Nobel Lectures, Physics 1981–1990. Singapore: World Scientific Publishing Co. Retrieved 22 May 2012. ^ Simon, Herbert A. (1978). Assar Lindbeck (ed.). Nobel Lectures, Economics 1969–1980. Singapore: World Scientific Publishing Co. Retrieved 22 May 2012. Campus building data from IIT Campus by Werner Blaser and from the IIT Campus Map. Wikimedia Commons has media related to Illinois Institute of Technology. This page was last edited on 11 April 2019, at 21:30 (UTC).